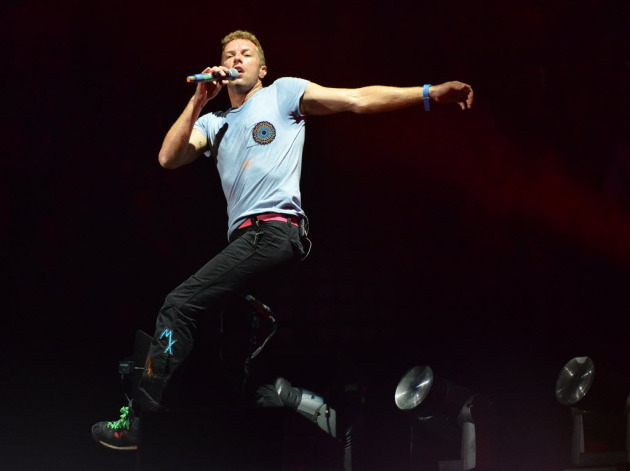 • Chris Martin has a lot of Bruce Springsteen in him, from the “anybody out there?” question at the beginning to the determination to make this the best show ever. Thing is that after an hour, Martin, 35, looked winded. Didn’t Springsteen, who is 62, just play a four-hour marathon recently in Europe? Plus, Martin makes some awfully cheesy (and insincere) comments to the crowd. But I did like how he connected with the 8-year-old when the quartet performed among fans in the bowl end of the X. • Martin’s falsetto makes it easier for women – who dominate his audience – to sing along. But he’s using less and less falsetto. • Loved the round video screens that Coldplay used – one behind the stage and four others smartly placed throughout the arena (not just flanking the stage). • Until the show was over, it was hard to tell how much graffiti covered the stage itself. The X-shaped mini-stage was covered in graffiti as was a wide curved ramp on the main stage. It all looked similar to the graffiti on the wall behind the stage. • As always, Martin’s clothes, piano and guitars were decorated with splattered paint. It has become his signature. • There was a child-like drawing taped to Martin’s main upright pianos with “paradise” spelled out in vertical letters. Did one of his kids do it? Or someone else? • Considering all the high-tech visuals that Coldplay used, having a video clip of Rihanna singing during “Princess of China” seemed chintzy. Didn’t expect a Tupac-like hologram but Brad Paisley’s fancy giant curved screen featuring Carrie Underwood in his show was jaw-droppingly terrific. • Appreciated Jonny Buckland’s increasingly versatile guitar work, including the rapier sound on the strobe-lit “Violet Hill,” the majesty on "Don't Let It Break Your Heart" and the chiming on "Yellow." • I’m still digging this Xyloband on my wrist. Curious about the technology; must be some kind of fiber-optics. I hear Coldplay owns the company that makes these devices. Wonder if I drive by Xcel tomorrow, will it still work outside the building? • Those were two of the weakest opening acts I’ve seen at a big arena concert. Charli XCX, a 20-year-old British popster, was just over-eager. Marina and the Diamonds – that’s what she calls herself, not her and her backup band – were intriguing but didn’t connect in an arena. Coming on like Bjork lite, she showed a strong voice and curious presence but she belongs in a club. • Remember when tickets originally went on sale, the concert was Saturday. The Friday show was the one added. Hence, there are probably fewer tickets available for the second concert, which is the last one on the band’s North American tour. Will they play the Olympics closing ceremony on Sunday?